History - Website of emmettwatson! Emmett St. Clair Watson, Jr., was born January 30, 1893 in Richmond, Virginia. His parents were Emmett and Julia B. Watson, both of whom were born in Virginia. His father was the manager of a wood & coal fuel company. Emmett Watson was the second oldest of seven siblings. They lived at 503 Miller Avenue, Brookland, VA. In 1900 the family moved to 2614 East Grace Street in Richmond, Virginia, where his father worked as a wholesale merchant. By age thirteen he had finished the sixth grade and worked full-time at a local engraving company that poduced advertising. By 1910 he was a staff artist at the company. He served as a cartographer in the U.S. Army during WWI and was stationed in France. His infantry was made famous by another regimental member, Joyce Kilmer, whose celebrated poem about their war experience, "The Rouge Bouquet," was made into a Hollywood motion picture starring James Cagney, called "The Fighting 69th." After the war he had moved to New York City to open his own art studio at 48 East 34th Street in Manhattan. His first published assignments were line drawings for advertising and interior story illustrations. On July 18, 1921 he married Marguerite Marie Elliott in the Church of the Transfiguration. The bride was born April 28, 1895 in Newark, NJ. Their son Emmett Watson III was born in 1922 and their daughter Marguerite was born in 1925. By 1928 he was painting covers for slick magazines, such as The Farmer's Wife, The American Legion Magazine, and Everybody's Magazine. In 1929 the Watson Family moved to Scarsdale, New York. At first they rented a home at 914 Post Road, but they later bought a home at 169 Madison Road. By 1930 the stock market had crashed and the subsequent loss of advertising revenue forced slick magazines to cut back. Emmett Watson was reduced to lower-paying freelance assignments in the pulp magazines, which ironically were entering their most profitable era. The pulps did not depend on advertising revenue, but instead sold cheap thrills to the masses. Most pulp artists aspired to "move up" to the slicks, but Emmett Watson was among a few artists, such as Albin Henning, Gayle Hoskins, and Delos Palmer, who were forced by circumstances to "step down" from the slicks to the pulps. 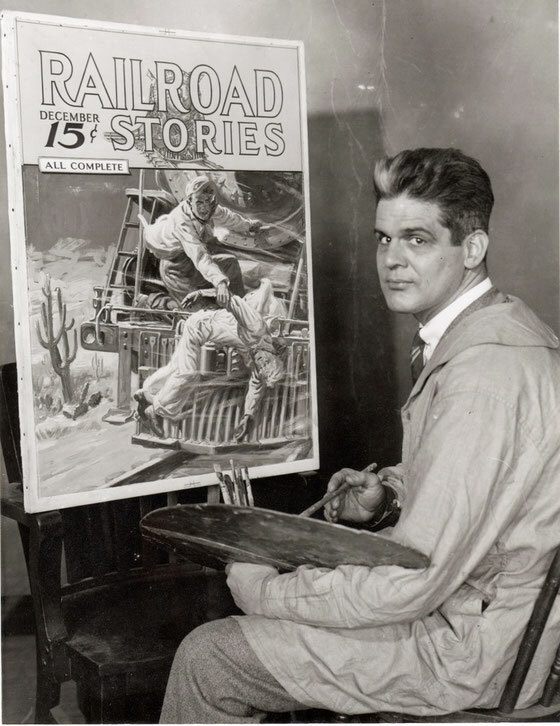 Watson sold most of his freelance pulp covers to the Frank A. Munsey Publishing Company for Argosy, Big Chief Western, Detective Fiction Weekly, and Railroad Stories. His work for the pulps was masterful. His confident drawing style, bold compositions, and joyous color schemes were very influential, especially for the younger pulp artist, Rudolph Belarski, who worked with Watson for Argosy. By 1940 as the economy grew stronger Watson left the pulps behind and returned to working for the higher-paying slick magazines, such as The Saturday Evening Post and Progressive Farmer. During WWII he created several patriotic posters, and after the war he produced hunting and sporting illustrations for calendars, advertising, and magazines. Emmett Watson died suddenly of a heart attack at age sixty-two on May 7, 1955 in New Canaan, Connecticut.